We have so many different, pre-made options for backgrounds, sometimes it can be hard to choose. Whatever you decide, the placing is quick and easy - and now it's all done the same way. 1. Click the Images Tab on the Page Designer left-side menu. 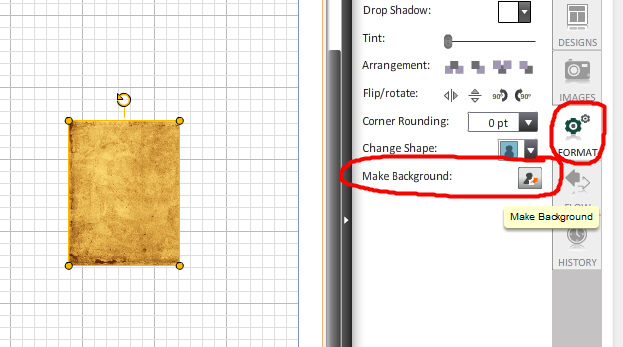 To choose from our pre-made backgrounds, click either Backgrounds_SAO or our exclusive Quick Creator™ backgrounds. 2. Drag the image of your choice onto your page. The image will place as a small photo box. Click on the image to select if the orange ball handles are not visible. 3. Click the Format button, and then Make Background. Be sure to check out all the clip art folders to see what options you now have for backgrounds. Don't forget to check out our exclusive Quick Creator folder. We've added new backgrounds PLUS coordinating clip art that let's you create new and exciting themes for your book.